American Waterways Operators, Inc. botage, to reserve domestic freight to domestic carriers is not unique to the United States. Nearly every major maritime country adheres to this principle today, recognizing the absolute necessity to national security of a merchant marine built, owned and manned by its own citizens. Two fundamental national interests are served by cabotage laws: first, the necessity of having a merchant marine of the best-equipped and most suita- ble types of vessels owned and op- erated by U.S. citizens sufficient to carry the greater portion of its for- eign and domestic commerce; and second, the necessity of having a strong merchant fleet, both domes- tic and international, to serve as an adjunct to national security forces. No merchandise shall be transported by water or by land and water, on penalty of forfeiture thereof, between points in the United States, including Districts, Territo- ries, and possessions thereof embraced within the coast- wise laws either directly or via a foreign port, or any part of the transportation, in any other vessel than a vessel built in and documented under the laws of the United States and owned by persons who are cit- izens of the United States. The Congressional aim in man- dating this section of the Act re- mains compelling today: to ensure that control of the shipment of —Ij-JLa-aiate that are built in the U.S. can move merchandise from one point or port in the U.S. to another, or to a vessel anchored in U.S. waters. 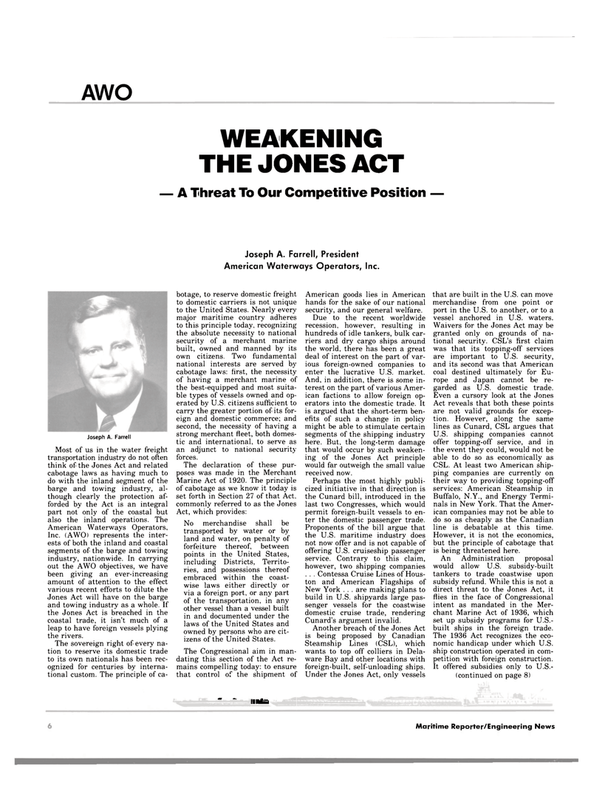 Waivers for the Jones Act may be granted only on grounds of na- tional security. CSL's first claim was that its topping-off services are important to U.S. security, and its second was that American coal destined ultimately for Eu- rope and Japan cannot be re- garded as U.S. domestic trade. Buffalo, N.Y., and Energy Termi- nals in New York. That the Amer- ican companies may not be able to do so as cheaply as the Canadian line is debatable at this time. However, it is not the economics, but the principle of cabotage that is being threatened here. An Administration proposal would allow U.S. subsidy-built tankers to trade coastwise upon subsidy refund. While this is not a direct threat to the Jones Act, it flies in the face of Congressional intent as mandated in the Mer- chant Marine Act of 1936, which set up subsidy programs for U.S.- built ships in the foreign trade. The 1936 Act recognizes the eco- nomic handicap under which U.S. ship construction operated in com- petition with foreign construction. Jones Act will have on the barge and towing industry as a whole. If the Jones Act is breached in the coastal trade, it isn't much of a leap to have foreign vessels plying the rivers. American goods lies in American hands for the sake of our national security, and our general welfare. Due to the recent worldwide recession, however, resulting in hundreds of idle tankers, bulk car- riers and dry cargo ships around the world, there has been a great deal of interest on the part of var- ious foreign-owned companies to enter the lucrative U.S. market. And, in addition, there is some in- terest on the part of various Amer- ican factions to allow foreign op- erators into the domestic trade. It is argued that the short-term ben- efits of such a change in policy might be able to stimulate certain segments of the shipping industry here. But, the long-term damage that would occur by such weaken- ing of the Jones Act principle would far outweigh the small value received now. Perhaps the most highly publi- cized initiative in that direction is the Cunard bill, introduced in the last two Congresses, which would permit foreign-built vessels to en- ter the domestic passenger trade. Steamship Lines (CSL), which wants to top off colliers in Dela- ware Bay and other locations with foreign-built, self-unloading ships.